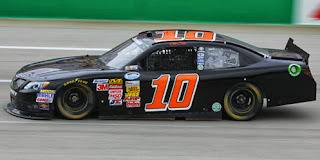 Jeff Green picked up the 51st last-place finish of his NASCAR Nationwide Series career in Saturday’s Kansas Lottery 300 at the Kansas Speedway when his unponsored #10 TriStar Motorsports Toyota fell out with a vibration after he completed 4 of the race’s 200 laps. The finish was Green’s thirteenth of 2013, breaking NASCAR’s single-season last-place record of twelve that Green set last year. It’s also his third last-place finish in the last four races and his first since Kentucky, two races ago. Green has four more races to add to his new single-season record. He already locked up his third consecutive LASTCAR championship at Chicagoland, four races ago. Green ran 29th and 28th in the weekend’s two practice sessions. He qualified 26th at an average speed of 178.124 mph, ranking him fifth among the twelve “go-or-go-homers” who attempted to make the field. Missing the show were Chase Miller, Green’s co-driver of the #10, who this time was behind the wheel of the #15 Rick Ware Racing Ford, and the Jimmy Means-owned #52 of Fontana and Chicago last-placer Joey Gase. Green pulled behind the wall at almost the same time teammate Hal Martin wrecked the #44 ORACLE Lighting Toyota. Martin returned to the track only to fall out after he completed eighty laps, securing Green the record-breaking finish. In the Bottom Five for the third consecutive race were The Motorsports Group teammates Josh Wise in the #42 and J.J. Yeley in the #46. Green edged Wise for 40th by four laps. Rounding out the Bottom Five were Blake Koch in the #00 SupportMilitary.org Toyota and Jeremy Clements, who lost the engine on his #51 RepairableVehicles.com Chevrolet. *This is Green’s first last-place finish in a Nationwide Series race at Kansas since 2010, when his unsponsored #36 Chevrolet, again fielded by TriStar Motorsports, fell out with suspension trouble after two laps of the Kansas Lottery 300. To put things in perspective, that was Green’s 13th last-place finish in Nationwide Series competition. His run on Saturday was number 51.